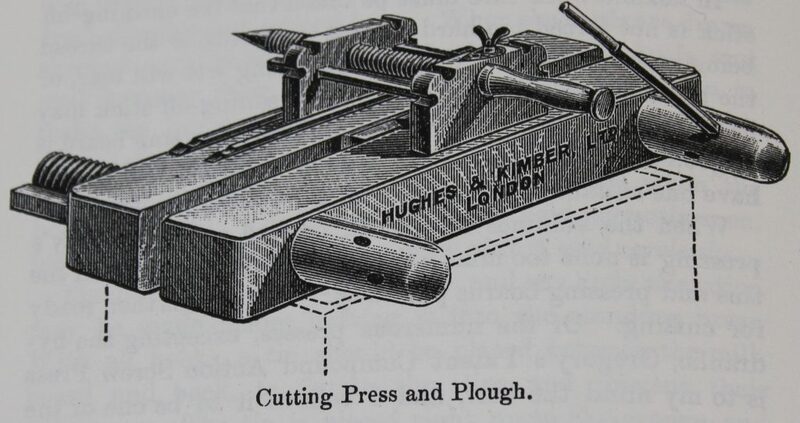 Press and plough: taken from Zaehnsdorf’s The Art of Bookbinding (1890) p. 60. I just bought this beautiful antique plough. Sadly I don’t have any information about it’s provenance; however, it’s almost identical to the one featured in Zaehnsdorf’s ‘The Art of Bookbinding’, it even has the same teardrop shaped brass plate under the wing-nut. The blade of the plough has an ‘N. J. Hill London’ makers-mark engraved on the underside, so I would guess that it’s at least 130 years old? It has a few worm holes but is otherwise in great condition, so is still a very useable tool. 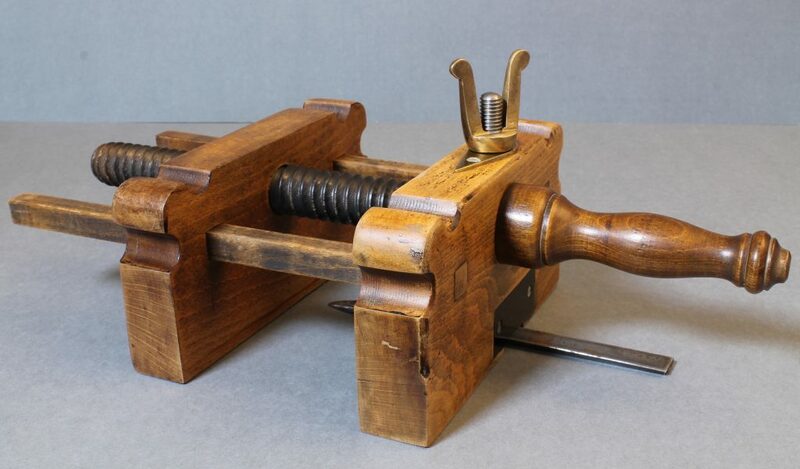 I do have a slight moral dilemma as I have an Olive and Oak laying press which has a single runner baton (rather than the two batons as featured in the engraving above) so to use the plough I would have to cut a slot in the base of the left cheek if I want to use this plough in anger. Thanks for sharing the photo of your new plough. Personally I certainly wouldn’t cut a grove in this plough. Plus I don’t think you need to. I think if you use it carefully it will work fine with the single runner. Just keep some pressure pushing the left side into the runner. While cutting the force from the blade will provide that force (I think). Or you could add a second runner like in the TAoB diagram. I think there would be enough clearance it wouldn’t interfere with the plough that came with the Olive and Oak. I bought a second hand Wiesner lying press and tub last year and it didn’t have a plough or the runners. Luckily Frank lives nearby, so I bought a plough from him and he added the runners. Of course he had a heap made up and it only took him 10 minutes to add them. Maybe you want another lying press just for this plough. Frank would certainly space the runners to fit. I’m not serious with this suggestion. But here’s some photos for fun. Trevor Lloyd uses a lot of Frank’s gear, and I know there is photo on the web of him using Frank’s plough, but can’t find it now. Here’s one with the press. I think that i’ll probably leave the plough for now – it would be a shame to alter such a nice example. I did try and use it as you suggested: sliding it up against the single runner but it moved about too much. However, a simple solution was to temporarily clamp a baton to the press to provide a second runner – this seemed to work well. I would be interested to hear how it compares with plough from Olive & Oak, pros and cons. Hi Roy. The original plough supplied by Jim was not made by him; the blade on this wasn’t great so i had to have another made, also the clearance isn’t enough – only 16mm, compared to 65mm on my Victorian plough. I think that a lot of the new ploughs on the market are made by people who have never used one! Jim’s on the other hand looks really well thought through. When i get hold of one I’ll let you know what i think.